Come and meet the current team, find out who they are, why they got involved and read any other interesting nuggets they fancied revealing. Hello my name is Carlton Avison, and for my sins I am the Chairman of Party On Potton. I have lived in Potton for the last 14 years with my wife and family, now running my own garage in Potton offering servicing and repairs to all types of vehicles. In my ‘spare’ time I am also a retained Fire Fighter at Potton Fire Station. I have lived in Potton for over 18 years with my wife Debbie, and during that time we have got married in Potton and have grown from being a young couple to a family of 4. During my time in Potton I have been Santa Claus at Potton Pre School and a Football Coach at Potton Lower, supporting the fantastic schools we have when I can. We as a family have always supported the community and the great events they have put on in the past but never really new all the hard work that went into these things. The last 4 years have certainly opened my eyes to what it takes to run these community events and I have got to know so many people and made many more friends through Party On Potton, than I would have ever envisaged, I am so glad my wife volunteered me back in 2012! If you do not see me at my second home (John O’Gaunt Golf Club) I am often found by a BBQ, in a Pub or doing circuits! I hope to see you all at Party On Potton 2018 and some of you at the AGM later in the year, so you can also become part of this fun committee! I love rugby, Guinness, my Defender (which I have now sold for an Isuzu) and trees! I’ve lived in Potton for 21 years and been on the committee for 8. I’m now treasurer, the perfect job for a Yorkshire man with deep pockets! Away from the lovely committee, I split my time between our lass, the kids and growing trees at Deepdale. Don’t forget you can always tell a Yorkshire man but you can’t tell him owt! I joined the POP Committee as Secretary in November 2016. Due to very bad scheduling we missed the Big Weekend 2016 and I decided this was the best way to ensure that it never happens again! Having lived in Potton with my husband, son and daughter for the last nine years I can’t think of any where nicer to be. The community spirit is what makes it stand out and POP and the Big Weekend are a big part of that. I’m delighted to be on the committee and can’t wait for the next Big Weekend! Oh, I’m still here, how did that happen? Why is this? Back for 3rd’s, I must be mad someone help me off this crazy roundabout. Please! After working non stop behind the bar after the carnival in 2016 I walked out for a breath of fresh Potton air to a sea of happy smiling faces and a real buzz. The place was absolutely heaving, people everywhere and I couldn’t help smiling. I was part of making that happen and helping to make Potton such a fab Town. It was at that point I rubbed by belly and decided I wanted to continue to spread community love and I’d be back for 3rd’s. Having only lived in Potton for 4 years when I joined Party On Potton, it’s been a fabulous way of meeting people and being made to feel part of the community. It’s become a real family affair as my partner of 25 years, Dave (yes you get less for murder) and my children all very much get involved especially at the Big Weekend. 2016 was the biggest Big Weekend ever, with sell out evenings and more people during the day than has ever been seen before, 2018 will be my 3rd Big Weekend as a committee member and I just hope I can do it justice again! I am a Potton girl born & bred! I went to the first POP weekend all those years ago in 2000 and have attended nearly all of them since. After The Big Weekend 2014 I decided I wanted to give something back to Potton and became a committee member! 2016 was such a fabulous event that I decided to carry on, now I know what I’m in for I can be more prepared! 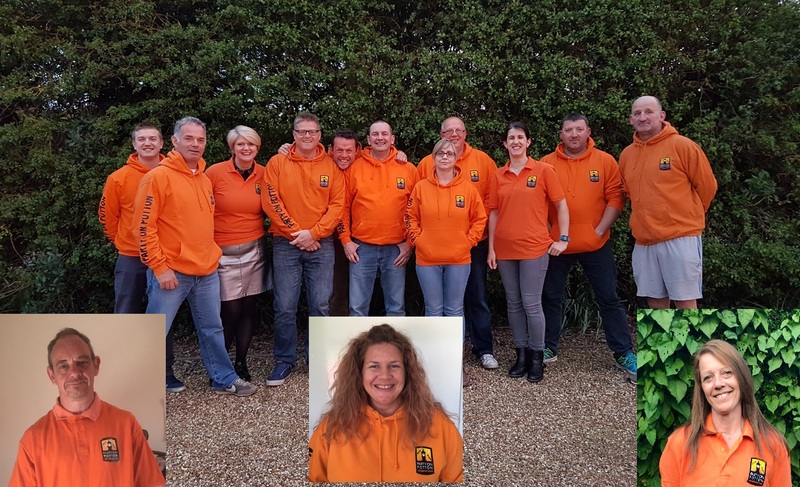 The POP committee are a great bunch to work with and when we are working fundraising bars together there is never a dull moment. I look forward to bringing The Big Weekend to you in 2018, let’s make it the biggest one yet! I moved to Potton in 2004 with my husband Nick and we have daughter who attends the local school. I joined the PTA at Potton Lower School in 2009 as Secretary and organised many events to raise money for the school. I thoroughly enjoyed my five years on the PTA and made some good friends as well as getting involved with Potton’s wonderful community. I have also helped out with Rainbows, Brownies, Cubs and Scouts over the years. I currently work for the Civil Service in Bedfordshire. I joined Party On Potton committee in 2014 just after the last Big Weekend. I’ve met some interesting characters on the committee and whilst working outside bars and BBQ’s to raise money for your Big Weekend. I enjoy keeping fit and regularly attend the bootcamp at local Triumph Wellbeing. I am in the process of joining the Retained Fire Service. I love the community spirit of Potton and the warmth and friendliness of it’s residents, which spurs me on to make the 2016 Big Weekend the best ever. I have lived in Potton for over 10 years now and chose to live here as it has a great community with all the amenities you could need. I have a family Joanna (wife) and kids who attend Potton Lower – Holly (6) and poppy (8 in July). As this is my second Big Weekend I am no longer the newbie of the POP committee, I continue to assist the motley crew in all they do and believe me it’s a lot. Whilst lots of hard work it’s fun and great being part of it. I do the interesting Health and Safety bit so you all have a fun and safe day. Having been to most of the Big Weekend events I went along to the Big Weekend in 2016 to lend a hand for a couple of hours and I’m still here! Ended up working the whole event (I hadn’t realised just how much work went into putting the weekend on) and enjoyed myself so much I decided to join the committee, and being that I’m the youngest at 22 I’ll hopefully have some new ideas to put forward. I’m Brett, aged 43, married to Vicki and we have 2 boys, William and Harry. I have lived in Potton for most of my life, my parents run the George and Dragon pub. I’m a self employed computer engineer, within the retail sector. I enjoy golf, golf and more golf. And venturing into the world of cycling. I have lived in Potton for 19 years married to Lloyd with two grownup children! Terri -Anne and James and one grandchild Matthew. My son James is also a POP committee member. I work locally and have attended POP events from the beginning in 2000 and have enjoyed all of them, this time I would like to get more involved so here I am. Having lived in our great pottonian community for the best part of 10 years now I felt it was time to do more for the community, first putting up and taking down of the Christmas lights and now the BIG ONE, THE BIG WEEKEND!!!! (Actually Carlton and Simon made me join, wouldn’t take no for an answer, Simon gives a really nasty Chinese burn and Carlton gives a really hard bear stare! lol). Although born in a great big city called Luton I have spent nearly all my life in and around the Potton area. I have been involved in the past with 1st Potton Scout Group and am currently a member of Shannon Express the local Barbershop Chorus.Potton for me is a jewel in the Central Bedfordshire crown, a place with a real community spirit and a place in which I feel very much at home. For a community to thrive and to be part of it I believe you have to engage and contribute and to the very successful POP Big Weekend in 2016 I was fortunate enough to ‘get roped in’ to help out and confess to having caught the bug. I only hope that I can make a positive contribution to the next Big Weekend in 2018!